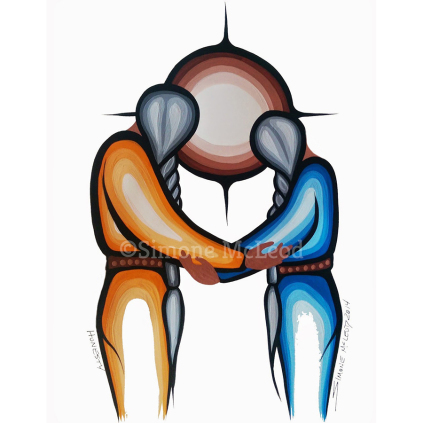 "To know Honesty is to walk tall and be yourself in your integrity toward others"
Our Seven Grandfather Teachings art cards are temporarily sold out. Soon a brand new series of 10 art cards will be obtainable in our Etsy Shop. Miigwech! Price of set of seven cards: 50 CAD (44 USD*, 36 EUR*, 5,24 JPY*) including shipping and handling. Each set of cards is printed in Canada and produced with the highest quality of printing techniques. Image protected by Simone McLeod Fisherstar Creations Copyright. *Actual prices depend on the current rates of exchange. Please note that you may reserve one or more sets of these Open Edition Print cards by advance payment; the entire set will be sent once the cards are available as of March 30, 2015. An advance payment of the full amount of $50 CAD will reserve a set complete with envelopes. Price includes shipping and handling and excludes 5% GST. When ordering one or more sets please mention "Seven Teachings of the Anishinaabe card set Item # SMB_01" and the desired quantity.